You can now receive the RBA birdnews direct to your Twitter feed. From breaking megas, the latest rarity and scarcity updates and all your local news, it’s all there. 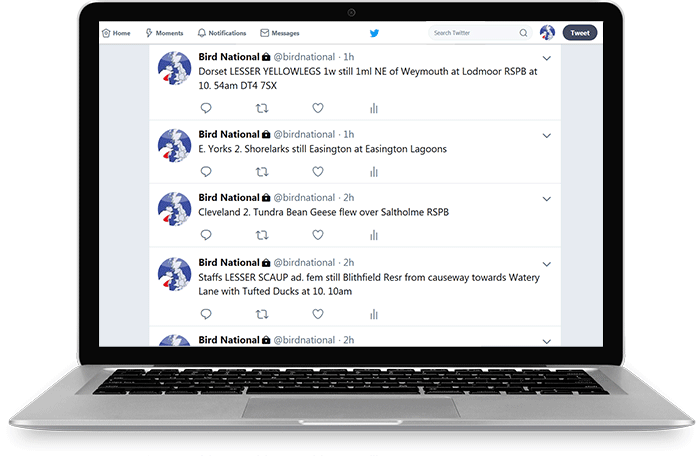 It works on any device on which you can view Twitter, including many devices for which there are no dedicated birdnews apps such as Windows and Blackberry. We have 11 different news feeds covering Britain and Ireland. Western Palearctic. Please don't submit follow requests for the feeds until you have emailed us (details below) and have had a reply. Email Us and we will get back to you with full details and how to get your free trial. Start your 30-day free trial now. You can cancel the trial before your subscriptions ends. To start your trial Email Us and we will get back to you with full details.